When Facebook went “mainstream” in 2006-2007, I was one of the first people to sign up. I’ve been on the social network for four years now. Now, as you know, people mature quite rapidly between mid-teens and early-adulthood. If you were to have a look at my Facebook profile, you’ll see a significant change between the Awais of 2007 (“hey guyz, wass up!? I jst came home from skewl lol”) and the Awais of today. When Facebook introduced the Timeline feature, I thought I’d have a look at the stuff I posted from four years ago and I was utterly horrified by the sheer amount of non-sense updates and photos I had uploaded. Thankfully, I now have a very easy way to delete all those embarrassing things I posted on not just my own but also my friend’s profiles: it’s an app called Exfoliate and it automatically deletes all your posts from Facebook from 1 month to more than 3 years ago! Check it out after the jump. Exfoliate helps you remove old content from Facebook(tm). Content on social networking sites is a potential threat to your privacy. Removing this content by hand is tedious, and practically impossible. Exfoliate helps you automatically remove of old Facebook(tm) content. We’ve tested the app on a Samsung Galaxy S II on Android 2.3 Gingerbread and can confirm that it works as advertised! When you launch Exfoliate for the first time, you are asked to log in to Facebook, give Exfoliate permissions to access your Facebook data (so it can delete it) and then start the exfoliation process. Exfoliate lets you choose where to delete data from (Wall, Albums, Friends’ Walls etc. 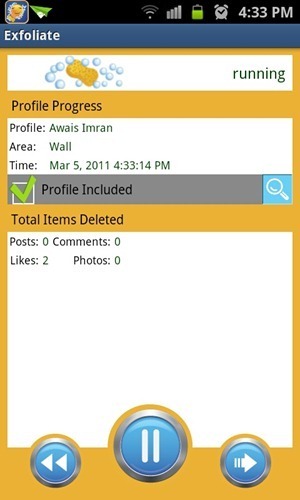 ), the types of posts to delete (comments, likes, photos, status updates) and the age of the posts to delete. Exfoliate was a paid app that has now gone free. If you couldn’t try it before, now’s your chance! Get it as soon as possible since there are chances Facebook may disable Exfoliate’s privileges. Facebook makes money off your data so what Exfoliate does goes against their interests.